​​​Want To Discover The Best Classical Music? ​​Don't miss out on discovering the best ​classical music on Amazon. Subscribe to our newsletter to download our ​free eBook guide. Instead of blasting the television on when its time to eat dinner, why don’t you use this time to expand your musical tastes? Many people find that listening to a new genre of music while doing something as soothing as eating can be a transformative experience. Our brains are so cluttered that exposing it to calming music can help with other aspects of your life. Classical music is the genre to rely on for emotional space since it lacks words yet still manages to make you sway. There is more than enough scientific research that points to the general direction that classical music has a positive impact on your mental health and overall well being. If you consider the act of listening to classical music as self-care, then you're on the right track to gaining all the benefits that it has to offer. Many people incorrectly assume that classical music is meant for an upper-class elite that can't be enjoyed by everyone. Don't make this mistake because you'll be missing out on a whole genre of music that can deliver an out of body experience. The easiest way to gradually incorporate classical music into your life is to listen to it while you're doing everyday tasks. For instance, you can download a classical music playlist to have ready on your smartphone so when you're either taking the subway home or driving; you have some tunes to de-stress to. If you don't like to listen to music while you're traveling, then you can try listening to classical music at home. Thankfully, the people over at Cobra Entertainment have compiled a list of classical songs that are ideal to play in the background while you're having dinner. Regardless of whether it’s a dinner party or just you, listening to the Dinner Classics Vol. 1 Classical Music Album is an excellent way to introduce yourself to the world of classical music. Below is a detailed review regarding the Dinner Classics Vol. 1 Classical Music Album, so you have all the information necessary before you give it a listen. If you're planning a dinner party, you could rely on the musical cues from this album to transition from the aperitif to the main course. Once everyone is done with their drinks, you could ask them to sit down and take their respective seats while you switch the album up to the main course. Don’t be upset if the party is adhering to the cues that the Dinner Classics Vol. 1 Classical Music Album is offering, You could always playback a track or skip over to another one. Thankfully, this isn't the only Dinner Classics Album to be released by Cobra Entertainment, so you have the option of listening to the Dinner Classics Vol. 2 Classical Music Album once you're done with this one. The main course section of this album consists of six songs that vary in length from two to five minutes. You’ll notice the difference between the two sections because the aperitif has more melodic, whimsical romantic strings while the main course features more piano inspired classical music. The last section of the Dinner Classics Vol. 1 Classical Music Album, the dessert part, remains to be unique in its tracklist as well as length. For instance, dessert includes five songs that don't sound anything like the aperitif and the main course. This is because the tracks that make up dessert are largely Concertos and orchestral based, so you’ll be hearing numerous instruments going off in a dramatic yet melodic way. Those who are streaming this off of Amazon will be happy to find out that optimal streaming quality is to be expected. This is to be expected of music you can stream off Amazon because the online vendor guarantees to offer songs with 256 kilobits per second. For a streaming service such as Amazon, you can’t get any better than this. Keep in mind that this doesn’t apply to the physical CD copy of the Dinner Classics Vol. 1 Classical Music Album. Buyers rave about how you don’t need any prior experience listening to classical music when you give the Dinner Classics Vol. 1 Classical Music Album a spin. The beauty about all the tracks listed in this album is that you’ll recognize several from films or television shows you may have seen. Based on positive buyer reviews, people agree that taking time out of their day to listen to the Dinner Classics Vol. 1 Classical Music Album has greatly changed their mood for the better. Think back to some of the most emotional times of your life and ask yourself if classical music is playing? Whether it’s a wedding, graduation, or a funeral, Western society loves to listen to classical music to elicit a reaction out of the audience. When it comes to eating dinner, since you’re doing something that already makes you happy, listening to the Dinner Classics Vol. 1 Classical Music Album will only amplify that feeling. The only place online where you can find the Dinner Classics Vol. 1 Classical Music Album is on Amazon. Almost all the music you find on Amazon nowadays can be streamed through the website itself. Those who have Amazon Prime or Unlimited don’t even have to worry about paying for the album because it’ll be free to stream. However, if you do want to purchase it, it’ll cost you less than $6. The price tag of a physical copy of the Dinner Classics Vol. 1 Classical Music Album ranges from $1 to $20 since they vary from being used copies to a collectible copy. You should check out Amazon, so you could listen to the samples they have of the Dinner Classics Vol. 1 Classical Music Album. We recommend buying the MP3 version of the album because you'll have immediate access to it. If you end up loving this album, you should give Dinner Classics Vol. 2 Classical Music Album a listen. ​Want To Discover The Best Classical Music? ​Don't miss out on discovering the best ​classical music on Amazon. 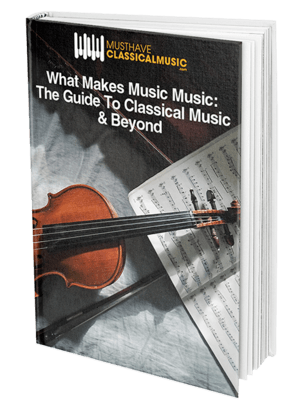 Subscribe to our newsletter to download our ​free eBook guide. ​​​​Want To Discover The Best Classical Music?